Hello little blog world; long time no hear from!!! So sorry about that I will try not to stay away so long next time!!! Let's see if I can recap all that has happened since I last updated. One word comes to mind Basketball, Basketball, and more Basketball!!!! Basketball season is well under way; i think we are about half way through the season. Jackson and his little basketball team are doing great! They have only lost one game so far; lets hope they can keep up the good work! Basketball is hard to take pictures of; it is so fast pace that I watch the game and get all into it and forget to take pictures or I take pictures and because it is so fast paced they turn out blurry! 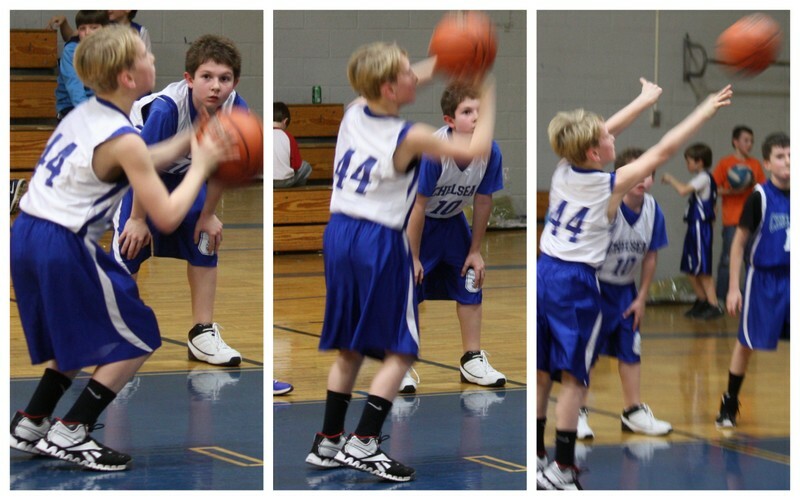 So here are the few I have of JP playing basketball! Brylee is still cheering for Basketball too but I don't have any updated pictures. She has missed 2 of the last 3 games due to other commitments so hopefully I can get some pictures this weekend. The last game she cheered at I was helping with the dance music so I was not out on the floor taking pictures so hopefully I can on Saturday!!! A good ole Sunday Snap from one Sunday after church. I like to try and get pictures of Jackson and Brylee on Sundays looking all cute but that doesn't always work out. Today they gave me one shot and this was as good as it got! Last Friday night Sister had her first spend the night birthday party! She was so excited. It was her BFF Mattie's birthday and her 2 other BBF's were all spending the night! I was a little worried about Sister making it all night but she did!!!! I was so proud of her. When I picked her up the next morning that was the first thing she said to me as she greeted me at the door... "I made it all night"! Sweet girl!!! Growing Up!!! Well those are all the pictures I have on my "real camera" I guess I need to do an iphone picture dump too since lots of my pictures come from my iphone camera these days!! !